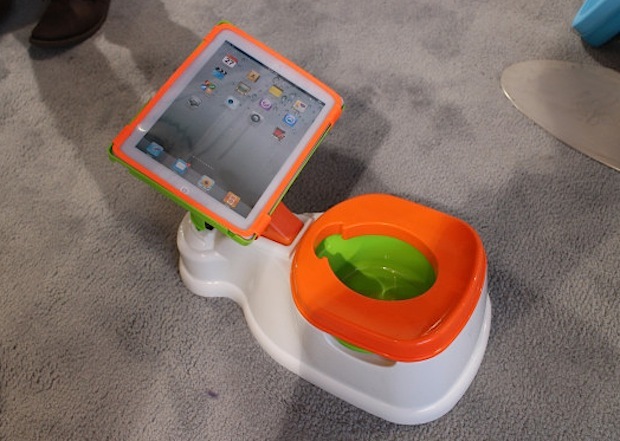 This lovely colorful plastic toilet is also an iPad stand, and that means you can now finally potty train a child (or yourself, no judgment here!) with the help of a convenient iPad-toilet combo. I don’t know about you, but I have far more questions than answers about this thing. Is there an app that goes along with this “accessory”? And what does that app do? Is this just the modern toddlers version of reading magazines while on the loo? This is either the absolute worst iPad accessory ever made, or contrarily, it’s perhaps the best accessory ever made, and I suppose your opinion of that is going to depend entirely on whether or not you 1) have kids that are being trained to use a toilet, and 2) your opinion of potential doo-doo butter being on or around the vicinity of an iPad. Me? Well personally, I’m not a fan of the mere concept of poos being in the remote region of my iPad, but I readily admit that I don’t have children that I’m trying to get out of diapers… so maybe I’m not the target market here. What do you think, worst iPad accessory ever or the best ever? Would this actually be useful? We’re not quite sure who made this amusing WTF find, but it was found by @MacFormat, cheers to them. Ehhh, maybe if it had a screen protector that was waterproof. Would absolutely hate to see the smudges on that screen though. Best. When toilet training, my kid spends a lot of time on the potty, and currently just has the iPad on a bench in front of him. So I have a 2-year-old that is currently potty training, and there is no way this would help. She would not ever go, because she’d be too distracted. Better for her to get on the pot, do her business, and get off. After, she can get on the iPad, maybe, as a reward. This is genius. My toddler has been addicted to the iPad for months and already has her own (the hand-me-down iPad 1) which sits in a Fisher-Price protection cover. Is there an app??? There are literally thousands of toddler-friendly apps – interactive books, counting, drawing etc. And as for poos on the iPad, that shouldn’t be a problem if it’s sealed in just like the Fisher-Price case. I would totally buy this. Can I? Shouldn’t the screen be rotated? As long as they don’t try finger painting….. This is exactly where an iPad belongs. In the crapper. I absolutely love it!! As I am potty training a 2 yr old and one of the ways I get my son to sit on the toilet for longer periods is to give him my ipad. With the help of Netflix and Caillou, he’ll stay on the toilet for minutes at a time (once he stayed on for 45 minutes). I wouldn’t buy this potty training toilet, but I like the creators thinking.